In August of 1794, at the battle of Fallen Timbers in Ohio, the English were finally driven from the western forts they had maintained since the Revolution. Although America's struggle with the British Empire had ended, revolutionary France was still embroiled in external wars and internal chaos. While French soldiers streamed into the Low Countries, the Reign of Terror raged, and some 40,000 royalists were executed, many by guillotine. Just as France had been a staunch supporter of America in its struggle for independence, American interest in the French Revolution had initially been highly sympathetic. But the primary difference between foreign support for each country's revolution was that France had a great deal to gain by helping America wrest its freedom from its arch rival, England. America, on the other hand, had virtually nothing to gain by supporting the French armies in their war against Great Britain. In fact, it had a great deal to lose: Customs duties and other taxes levied on British imports amounted to roughly 80% of the money used to operate the federal government in the 1790s. With America's focus shifting from revolution to nation building, its alliance with France was further strained by that nation's continuing societal violence, which frightened and horrified many on this side of the Atlantic. Against this background of deteriorating American sentiment toward France, it was ironic that the central design of a French medal was used to represent the concept of Liberty for the U.S. half cent. The Libertas Americana medal that inspired the 1793 half cent was designed by French medalist Augustin Dupre as a celebration of American victories in the Revolutionary War. Intricately detailed and highly expressive, the medal made an excellent model for a coin. But the original adaptation of the design lasted only one year. In 1794 Chief Engraver Robert Scot modified the design by enlarging the bust of Liberty and having her face right rather than left. He also greatly increased the size of the "mob" cap set on top of the Liberty pole. An innovative mechanical experiment was tried with the reverse. Rather than using individual device punches to make up the die, Scot created a complete reverse hub that included the wreath, all lettering, and denticles around the border. The wreath was similar to the one from the previous year but without the sprays of berries. The entire design was sunk in higher relief than the half cents of subsequent years. Actually, the half cents of 1794 represent a distinct type, quite different from the half cents of 1795-97, but traditionally included with the later years. The dies for the half cents of 1795 through 1797 were cut by Assistant Engraver John Smith Gardener, who lowered the relief, reduced the size of Liberty and hand-punched in the wreath. While the series has only two major design types, it includes numerous varieties, including the so-called "punctuated" date of 1795, created by a slip of an engraver's tool, which resulted in the date reading 1,795. Varieties with the pole missing in front of the bust of Liberty exist for both 1795 and 1796. In both cases an unintentional flaw, but caused in 1795 by excessive lapping of the die, while the following year the die sinker apparently forgot to punch in the device. 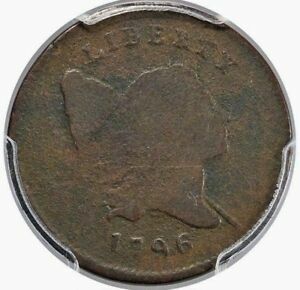 Some half cents from 1795 and 1797 were struck from cut down Talbot, Allum & Lee tokens, necessitated by the Philadelphia Mint's frequent shortages of copper planchet stock during the 1790s. Occasionally remnants of the host token can be seen with traces of the ship's sails or the peripheral lettering apparent on the finished half cent. Plain edge and lettered edge varieties are known in 1797. Lettered edge examples are very rare and seldom seen above Fine condition. 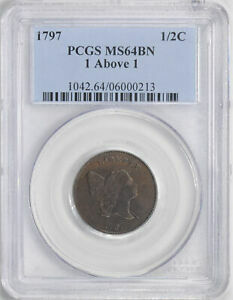 One of the most prominent varieties in the series is from 1797 and shows a numeral 1 directly above the 1 in the date. This error was created when the numeral was first punched into the die much too high and close to the bottom of the bust. Rather than effacing the error by polishing the die, the date was simply punched in the working die in the correct position with the first, higher positioned numeral remaining clearly evident on the struck coins. During the four years Liberty Cap half cents were struck, a total of 359,529 pieces were produced. No true proofs are known. 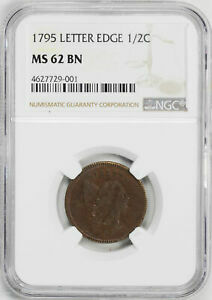 As with all early coppers, planchet quality varied greatly and there is considerable variation in striking characteristics from one year to the next. 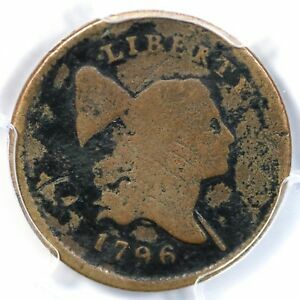 The coins from 1794 are invariably deep brown or black in color while those from 1795 are usually light brown. 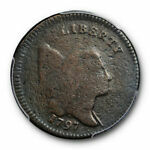 Half cents of 1796 are once again dark brown or even black and many exhibit porosity and planchet flaws. 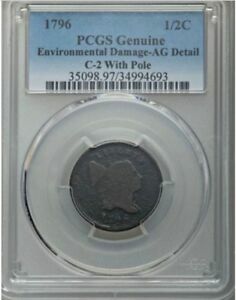 Planchet quality in 1797 is above average for the series, most likely because of the large number of coins struck from Talbot, Allum & Lee tokens, which had been manufactured from high quality English copper blanks. Electrotype counterfeits are known of all four dates, and there are a number of recognizable struck copies of the 1796 with Pole. These pieces were produced in the mid-19th century by a British coiner named Singleton, and sold by Dr. Francis Edwards, an English physician who immigrated to New York and died there in 1865. They differ noticeably from genuine coins in the style of the head and larger sized letters. Because of the rarity of genuine examples, Edwards copies have become collectible in their own right and surprisingly high prices are often commanded by these non-authentic "coins." Grading this design can somewhat of a challenge because of the variation in planchets and striking quality from year to year. On high grade pieces wear begins to show on the obverse at the forehead, above the ear, and on the highest point on the shoulder of Liberty. Friction on the reverse is first seen on the leaves beside the H in HALF, on the bow knot and the ribbon ends. Liberty Cap half cents possess undeniable appeal for both novice and advanced numismatists, and enjoy strong demand from date, die variety and type collectors. 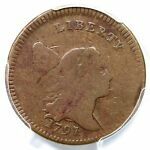 Although half cents have always seemed to have second class status in relation to large cents - both as a circulating medium and among collectors - die variety collecting of this denomination has gained many new adherents as more research is published. Cohen's 1982 American Half Cents and Breen's 1983 Encyclopedia of United States Half Cents have added much to the body of information available today. The Liberty Cap half cent was last struck in 1797, when production of the denomination was suspended. The half cent would not appear again until 1800, this time with Scot's adaptation of Gilbert Stuart's Draped Bust design. Bailyn, Bernard, The Ideological Origins of the American Revolution, The Belknap Press of Harvard University Press, Cambridge, Mass., 1972. Bowers, Q. David, United States Copper Coins, An Action Guide for the Collector & Investor, Bowers and Merena Galleries, Wolfeboro, N.H., 1984. Breen, Walter, Walter Breen's Encyclopedia of United States Half Cents 1793-1857, American Institute of Numismatic Research, South Gate, California, 1983.